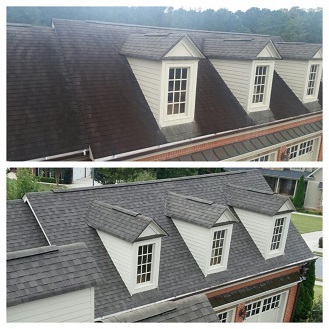 Our Atlanta Roof Cleaning services can make your roof look new again! We use a non-pressure process to apply our roof cleaning solution. We use no more water pressure than what typically comes from your water hose. A pressure washer should never be used to clean your roof. The high pressured stream of water produced by a pressure washer will dislodge large quantities of the protective granules covering your shingles and leave your shingles vulnerable to the elements. This will lead to early roof failure and void any warranty that you may have on your shingles. The darkened areas of your roof caused by algae growing on your shingles will absorb more heat from the sun’s rays. This increases the heat in your attic, causing your air conditioning system to work harder to cool your house, therefore increasing your utility bill. Once the dark stains are removed, the roof will attract less heat, which will result in spending less to cool your home. 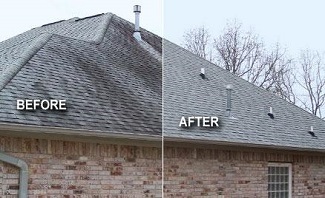 Call us today for a FREE Estimate on cleaning your Atlanta, GA area roof. We work with residential and commercial clients all around the Metro Atlanta area. We are the premier roof cleaning company in the Atlanta area for homes and businesses.